Of course the Little Mermaid and the Lion King would also definitely make top 5, but this is a strictly Disney list. None of this Disney/Pixar business, because they are in two very different leagues, my friends - like comparing apples and oranges. AMAZING DELICIOUS fruits, but two different kinds of fruit nonetheless. In any case, let me justify my choices. What sets these 3 films apart for me is their fierce heroines. These women aren't wimpy princesses who wait around all day for a prince (think: Snow White, Sleeping Beauty, Cinderella, et al) - although I would also include Ariel and Pocahontas in this category. These are women who don't stop at dreaming, but actually actively pursue these goals. And what I really like about these women is that their lives don't revolve around men. They can be just as strong without them. They're not waiting for true love's first kiss - they want adventure. They demonstrate courage, confidence and charisma - they are women who know who to stand up to and defy the patriarchal society in which they are prove they need not - and indeed can not - be condemned. 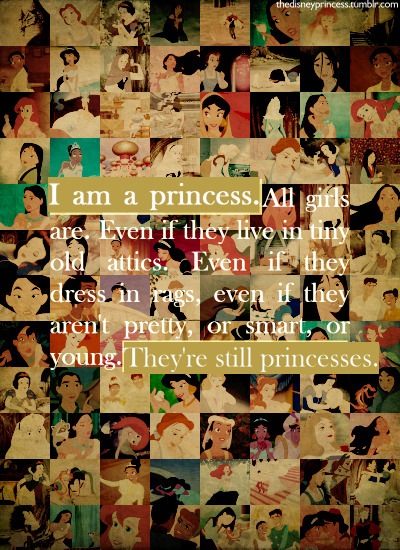 Mulan is by far my all time favourite Disney films, mainly because I watch it and feel proud to be a woman. Yes, it makes my feminist heart happy. 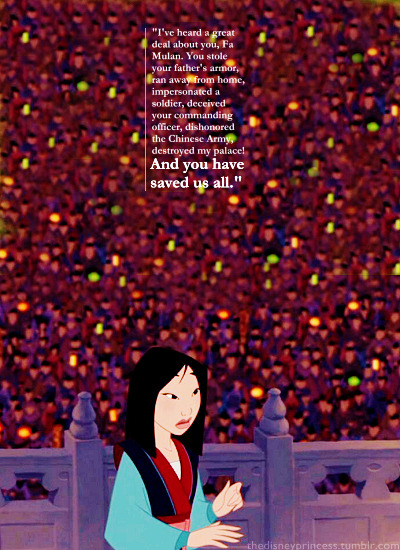 Mulan is funny, smart, sassy, bold, fiercely loyal and doesn't pine for a man in her life. She doesn't think twice about making sacrifices for the ones she loves, or to do what is right. She is a heroine to admire and aspire to be. Belle is probably a close second, because I can relate to her - off in her own world, a day-dreamer, a book lover. Belle, too, is someone who won't settle, who makes up her own mind, sets stock in her own opinion, sees through the facade of others (see: Gaston), doesn't judge people by their appearances (see: the Beast), is selfless, kind, and wants to believe the best in people. 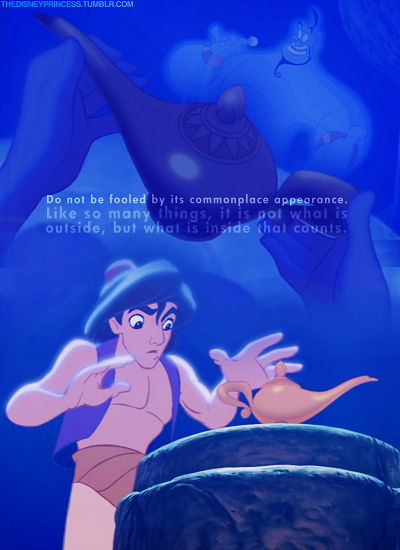 Really I love Aladdin for the genie and his musical numbers, but also because Aladdin himself is a total babe, and yes, Jasmine is a fiesty symbol of awesome. She will not marry for anything less than love, and takes it into her own hands to find it. Actually Tatiana would be 4th on my list of favourite Disney heroines, because there's a girl who is working towards her dream. She's made of stern stuff, and knows what is needed to make her dreams come true. 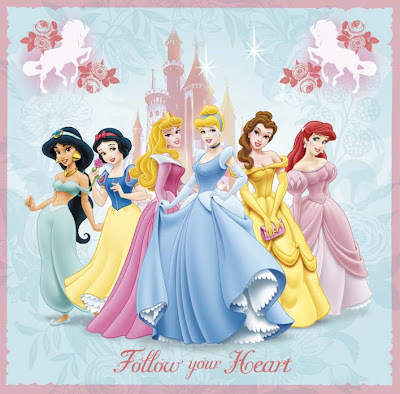 I would also argue that being a Princess is not about a title, it's about character, which is why the definition of Disney Princess is usually extended to include Mulan, Pocahontas, Tatiana, etc. So: your top 3 Disney films? 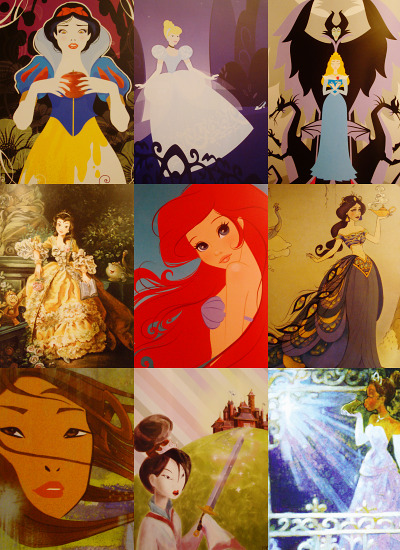 Got some awesome alternative Disney princess art to share with you..will link to you on Facebook if I can! @Aerialgrrrl: please do! you know I love whatever you link me: I shall call you Queen of the Interwebs! Sara: Hi 5! :P I'm Asian and I woop out loud at Mulan! 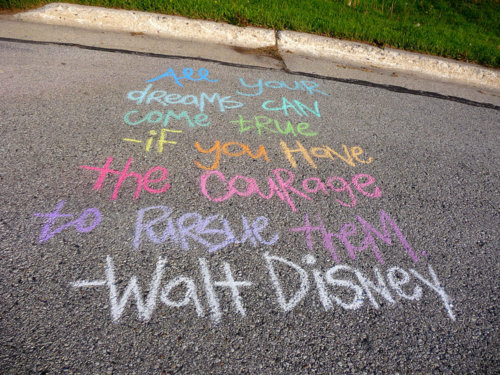 Anyway...to me, the Disney films symbolize my childhood, dreams, femininity, strength, light and fantasy. I don't think I want to analyse them too much because, for me, they're mainly memories. Like a trip or something. So while I thoroughly enjoyed reading your post, JAG (I always love reading your posts and am *infinitely* jealous of your South American adventures), my list is solely based on my memories of enjoyment from watching them. Haha! 1) Robin Hood. A beautiful retelling of the tale, that is full of adventure, politics, romance and beautiful colours and animals. They nanage to give every kind of animal their own characteristic and really transform an English folktale into a colourful fable, with morals and surprise and music. I love this film to bits! 2) Pocahontas. My heart flies a little bit whenever I hear "Colours of the Wind, and it's beautifully made. The scene at the waterfall takes my breath away. The pride she feels for herself and her people is contagious. Haha yes I know I've been a little analytical in my approach to Disney, but never fear, the fangirl is never far from the surface! Honestly, these would be my top 3 out of love alone, for their songs, their love stories, their utter beauty and sheer tragedy - I related most to Belle (and probably second most to Rapunzel) but my relationship with Disney films - in particular Disney princesses, who I've loved and idolised since I was young - has been something I've been thinking about long and hard lately. I just can't help but wonder (and worry) how much influence Disney has over us at a very young (and crucial, formative) age; how much it shapes our ideas about love, happiness, bravery, what it means to be a woman, ambition, hope, courage, dreams, fear - to what extent it's lead me to build up The Kiss, to feel lonely, to need/crave/want a boyfriend - are these natural, internal desires? Have they been flamed by society, or inspired by Disney, or is this my unique brand of crazy coming to the fore? (All valid options!) Now I'm not blaming Disney for anything, but I do wonder how much power it has over our subconscious (and otherwise) development and thought process. And I think because I continue to rewatch the films even now, to rediscover that joy, delight, happiness, warmth, adventure, surprise, music, strength and fantasy you talk about, it's all tangled up with my current emotions and reflections. This is really hard because the only one's I've watched since I was a kid are... Aladdin and Pocahontas. 3) Probably Mulan, but I really haven't seen it in ages. Let's go to my nursery you guys!